With so much talent at the 61st Newport Jazz Festival, it is often difficult to choose who to see during the course of the day. In this way, the audience must 'improvise' their schedules as they go by the scenery, stages and vendors. Yet, no matter your choice, each act is an educational experience that allows this great tradition to, as the late Clark Terry said, "keep on keeping on." 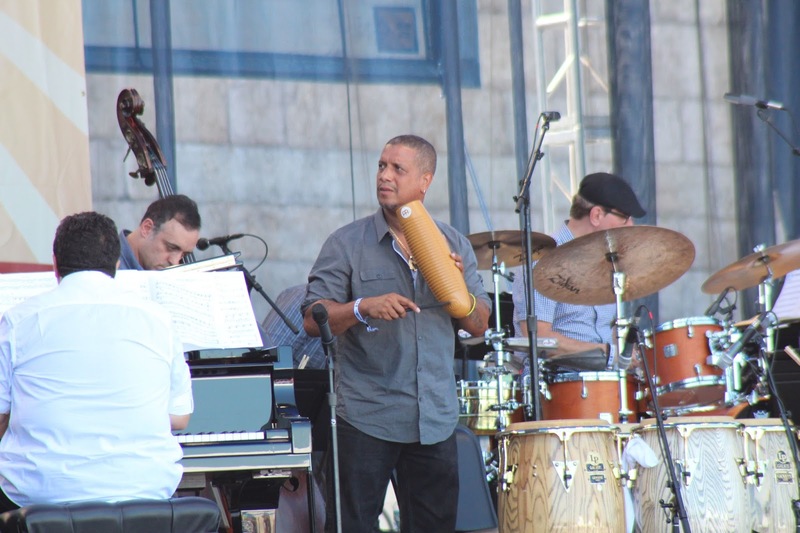 Today was a thrilling third and final day of the Newport Jazz Festival. I had the good fortune to see the MMEA All State Band, Arturo O'Farrill's Afro Latin Jazz Orchestra with special guest Rudresh Mahanthappa, Michel Camilo/Hiromi Piano Duets, Ashley Kahn's talks about Miles Davis and the electic guitar & Miles Davis and the St. Louis trumpet tradition, Frank Kimbrough solo piano, the Fred Hersch Trio with John Hebert & Eric McPherson, the Lou Donaldson Quartet and the Mike Stern/Bill Evans Band. 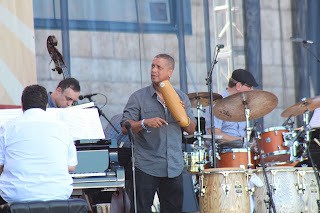 Read about Newport Jazz Day 1, Newport Jazz Day 2. I started off the day by catching some of my friends at the MMEA All State Jazz Band. The big band played a mixture of styles, from classic Ellington tunes, "Rumpus in Richmond", to even a funk-style Tower of Power song, "Soul Vaccination". 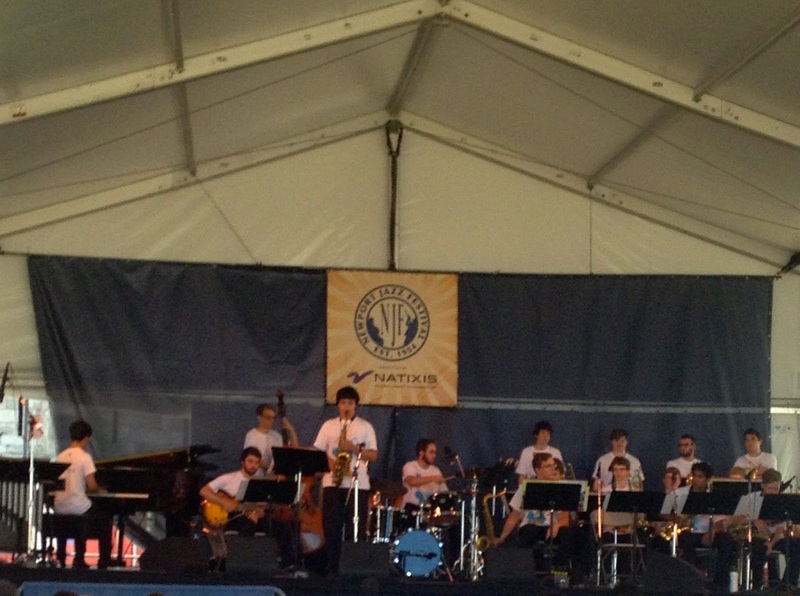 The Newport Jazz Festival and Newport Festival Foundation has several educational outreach programs, such as this, to help support young musicians. Pianist-composer-bandleader, Arturo O'Farrill's Afro Latin Jazz Orchestra with special guest Rudresh Mahanthappa played a collection of rhythmically intricate, highly orchestrated songs, exploring the Afro-Cuban traditions set forth by trumpeter Dizzy Gillespie and percussionist Chano Pozo. 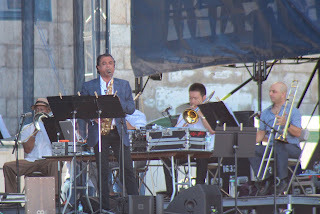 The jazz orchestra played several songs, including "Vaca Frita" and "Triumphant Journey", which highlighted the all-star soloists in the group, including O'Farrill's son, trumpeter Adam O'Farrill. 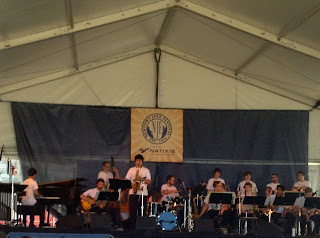 Saxophonist Rudresh Mahanthappa joined the orchestra for the ambitous "Afro Latin Jazz Suite", which was written for his bright, singing alto saxophone sound. Highly danceable and vibrant, O'Farrill also used his set to highlight socio-political issues with a spoken word addition to "They Came", which highlighted the struggles of Puerto-Rican Americans. 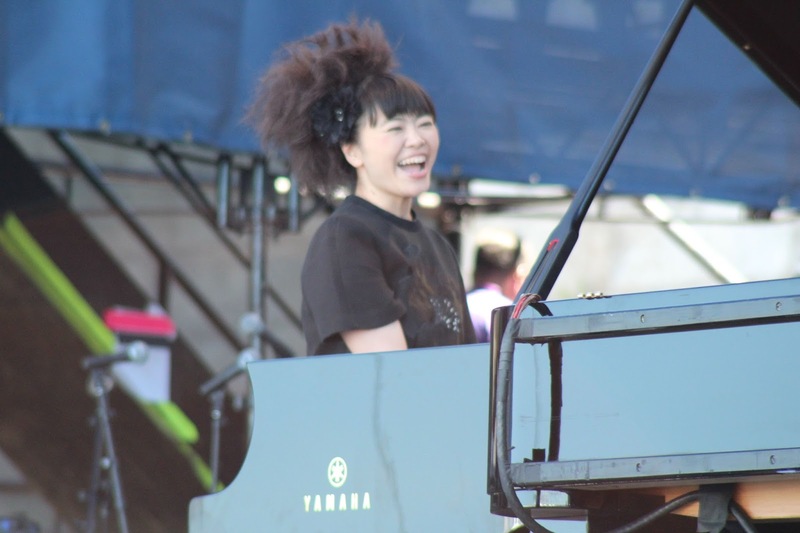 The founder of the festival, George Wein, brought together two of his favorite pianists, Hiromi and Michel Camilo, for a special duo concert. Much like the piano duo concert I saw with Herbie Hancock and Chick Corea at Boston's Symphony Hall, the sound of the two grand pianos spun through the air, creating the harmonic depth and color scheme of a full orchestra. 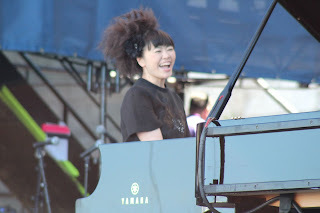 A huge fan of piano duets after listening to NPR's Piano Jazz with host Marian McPartland, Hiromi and Camilo did not disappoint with their complementary, harmonically dense styles. 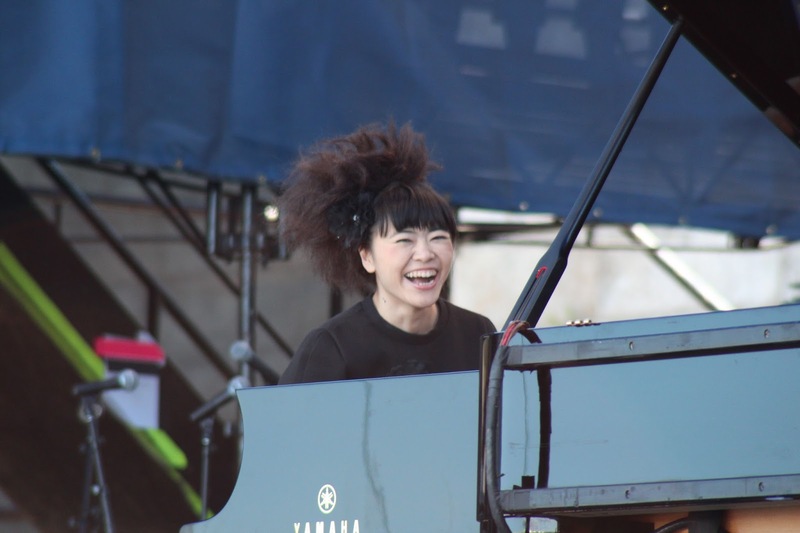 Interpreting such standards as "Caravan" and "Billie's Bounce", the two pianists played to the same heartbeat, finishing each other's musical phrases with immense vitality and wit. At the new Storyville stage, I enjoyed part of Ashley Kahn's talk about Miles Davis and the electric guitar. 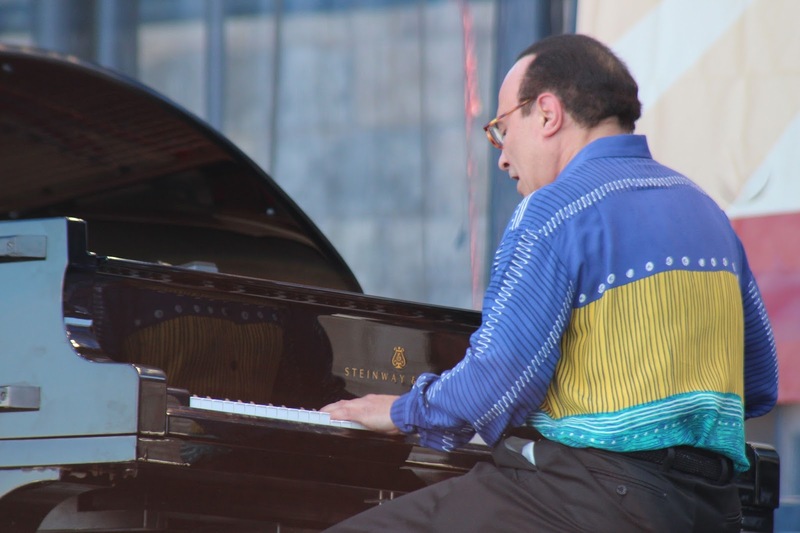 A member of Miles Davis' band in the 1980s, Stern talked about Davis' fusion period, where he melded rock and funk with jazz. 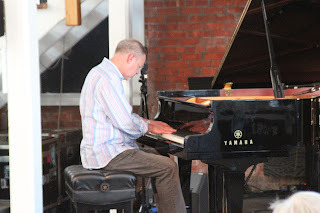 Pianist Frank Kimbrough played a solo piano set at the Storyville stage. This new, more intimate stage was the perfect venue to house Kimbrough's light touch and far-reaching melodies. Kimbrough maintained a meditative focus throughout the set, melding several songs into a nearly continuous performance. 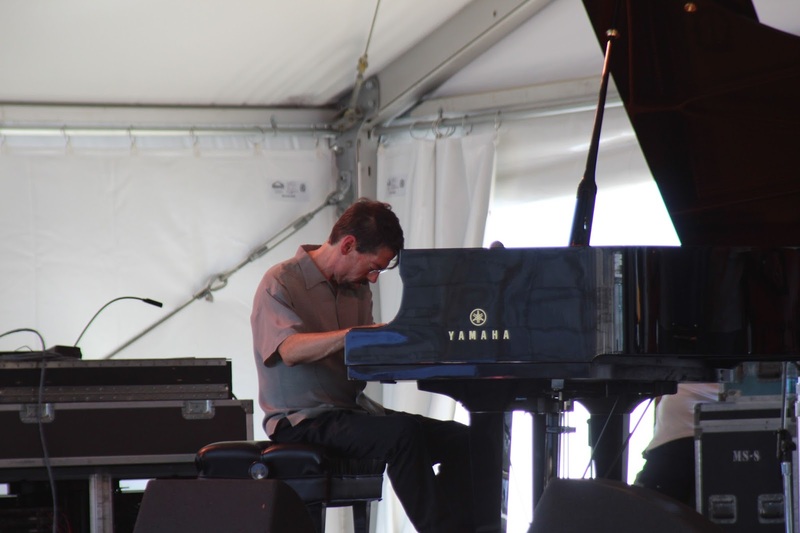 Flowing from Ellington's "Come Sunday" to Monk's "Crepuscule With Nellie", Kimbrough allowed the music to float and lift through the calm, introspective audience. The Fred Hersch Trio with John Hebert and Eric McPherson has the unique ability to express clarity in an enigmatic way. With a light touch and a telepathic connection with his bandmates, Hersch phrases his melodic lines in a manner that is simultaneously spacious and full. 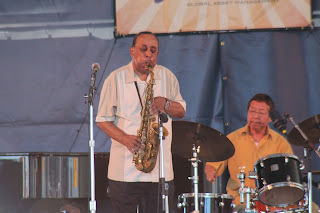 His set included his original composition "Whirl" as well as a composition by the late Ornette Coleman, "Lonely Woman". 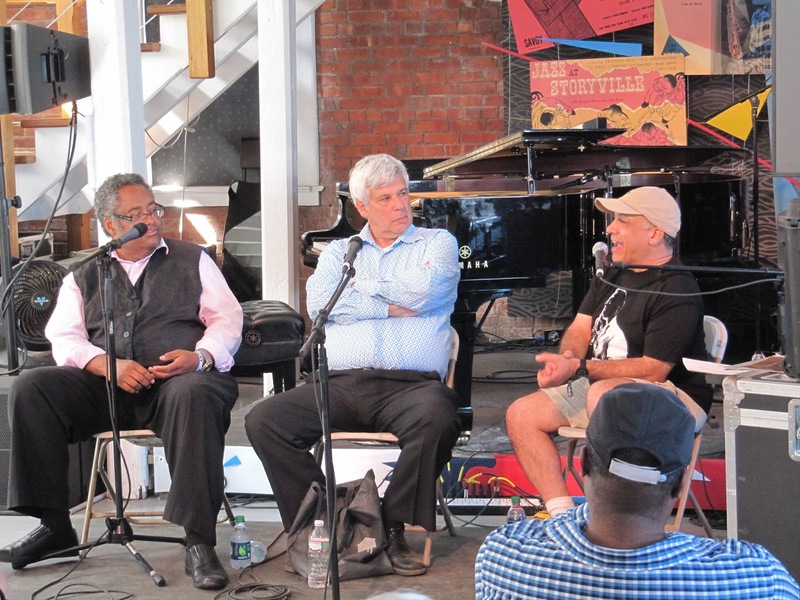 At Storyville, Ashley Kahn talked about Miles Davis, Clark Terry and the St. Louis trumpet tradition with trumpeters Jon Faddis and Randy Sandke. 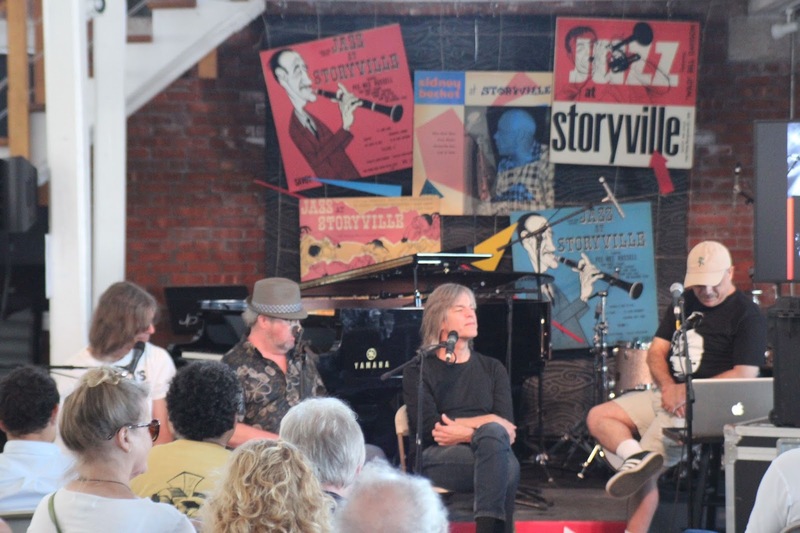 Exploring Miles Davis' roots in St. Louis, and his mentorship with the great Clark Terry, the panel speculated on how Miles' personal sound came to be through his local influences. 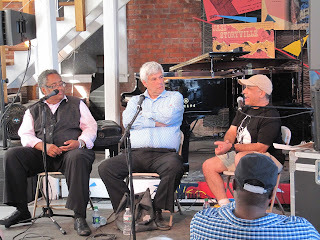 Focusing much on the late Clark Terry and his influence on the trumpet lineage, the panel urged the audience to watch the documentary, "Keep On Keeping On", which is not only about Clark Terry, but about positivity. 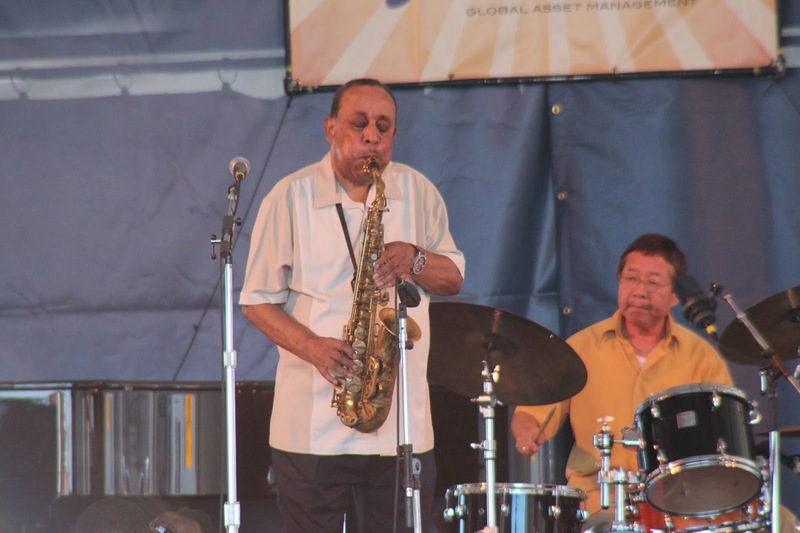 A true veteran of the music, saxophonist Loy Donaldson is often associated with soul jazz and bop. Donaldson played his seminal song, "Blues March", showcasing his own blues roots and vocal style of articulation. His bright sound was agile and seemed to flow like water out of his instrument with his connected lines. The crowd boded well with Donaldson's sly joking, saying that he's playing at the festival at age eighty-eight, "because the devil won't take me." 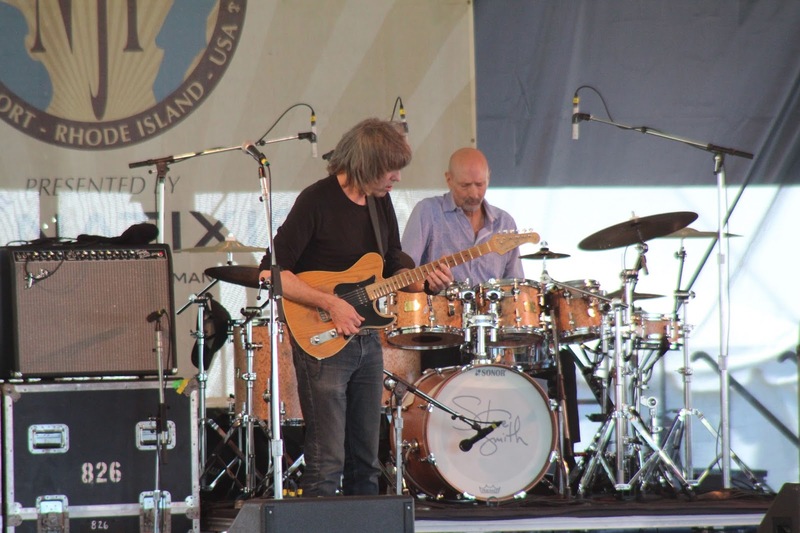 The Mike Stern/ Bill Evans band combined the raw, combustible energy of rock music with the progressive harmonies and extended improvisations of jazz. 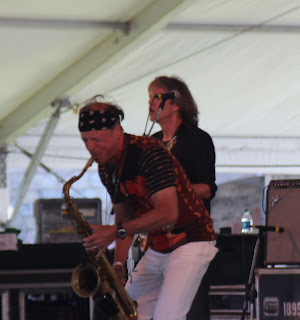 Both veterans of Miles Davis' jazz fusion bands, guitarist Stern and saxophonist Evans have continued in this pathway by presenting new compositions with a focus on group sound and dynamic. 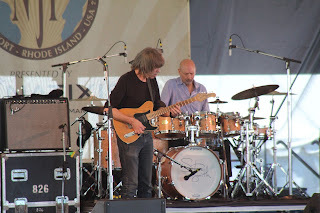 From "Out of the Blue" to "Wishing Well", the Mike Stern/ Bill Evans band connected with a wide age-range of audience members due to their variety of cross generational musical influences. 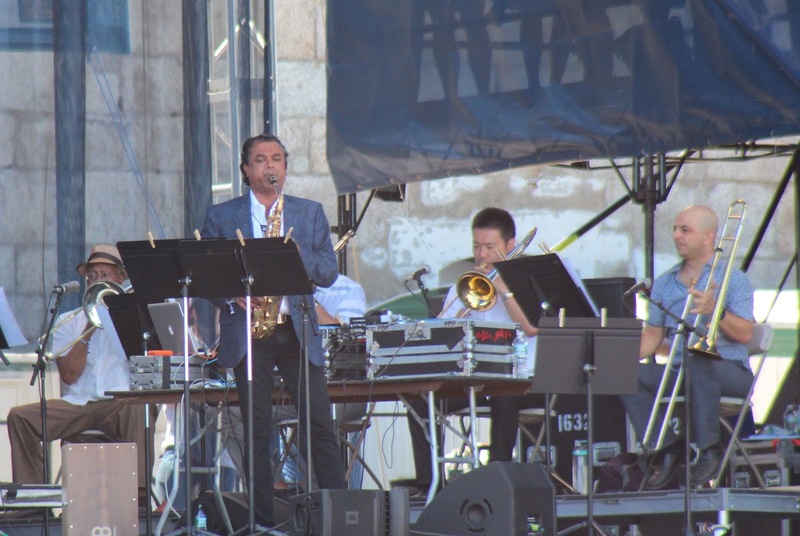 The 2015 Newport Jazz Festival is officially over. With so many fond memories, I have to say, Newport is truly the place to be. 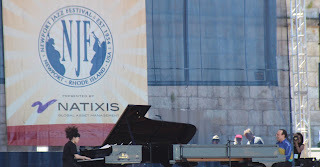 And with a foundation as solid as the Newport Festivals Foundation, Newport Jazz will surely be keeping on for many years to come. Please visit my jazz poetry blog, "Without a Poem", where I improvise a new poem everyday! I also share jazz music and art there, so stay tuned! Seeing Hiromi inspired my haiku: "When I see those cats".